Ashwagandha Leaves that we offer are well processed and thus, buying them from us will be the safest option for the buyers. 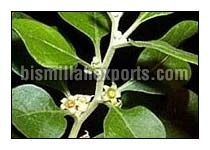 We are enlisted among the reputed Manufacturers, Exporters and Suppliers of Ashwagandha Leaves. We are efficient enough to process retail as well as bulk orders for Ashwagandha Leaves even at short notice period. These leaves can be obtained from us at the most reasonable prices. Medicinal Uses/Health Benefits : The shoots of the Ashwagandha shrub are used in in food and in India seeds of the Ashwagandha are used to thicken milk. It has similar properties as ginseng. Ashwagandha is heat neutral which means it has no warming or cooling properties. Unlike ginseng which is a warming herb. Ashwagandha is usually crushed and used in a traditional Ayurvedic formula called shilajit. Ashwagandha helps person's suffering with stress, weakness, tissue deficiency, the elderly, overwork, lack of sleep, nervous exhaustion, sexual debility, problems of old age, loss of memory, loss of muscular energy, insomnia, weak eyes, cough and glandular swelling. The modern medical uses of Ashwagandha are varied. One area in which it has been particularly helpful is in the treatment of mental health issues. According to studies conducted by various institutes, it has been so found that anxiety sufferers if taking 40 ml doses twice a day of a solution with its major ingredient of Withania Somnifera; then within 30 days all anxiety symptoms including panic attacks and paranoia had virtually disappeared. Therapists have also found the herb useful in treating depression, alcohol dependency and schizophrenia.